Suitable for office, home, factory, retail, warehouse, the Superlite offers a space saving folding design allowing it to fit into small storage spaces or car trunks. With the push of a button, the frame extends and wheels move into working position simultaneously. Elastic straps included for securing load. This cart is great! I would definitely recommend it. I bought this for moving items I use for, of all things, showing my dog at dog shows. Often, the show ring is a long distance from the parking areas which makes things difficult. This product makes the whole process so much easier and less stressful. I ended up helping several other handlers move their stuff after I took care of mine.I've also found a few other uses for it around around the house and yard. It's very userfriendly, sturdy, and actually attractive. My husband was even impressed...which is had to do. 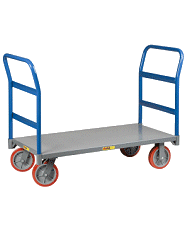 We actually purchased this cart for use at meetings and in airports, but I had to use it to move some boxes and it works great. Easy to open and manuevers with ease. 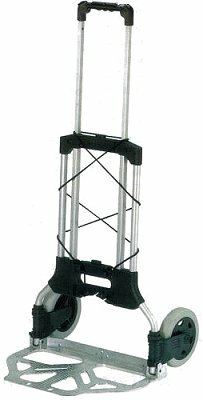 I chose this handtruck because of its collapsibility, light weight, and large wheels. And, it exceeded all my expectations. Light weight, but transports almost anything around the house. Great for hauling boxes up and down the stairs.